By buying this product you can collect up to 10 loyalty points. Your cart will total 10 points that can be converted into a voucher of CAD$2.00. 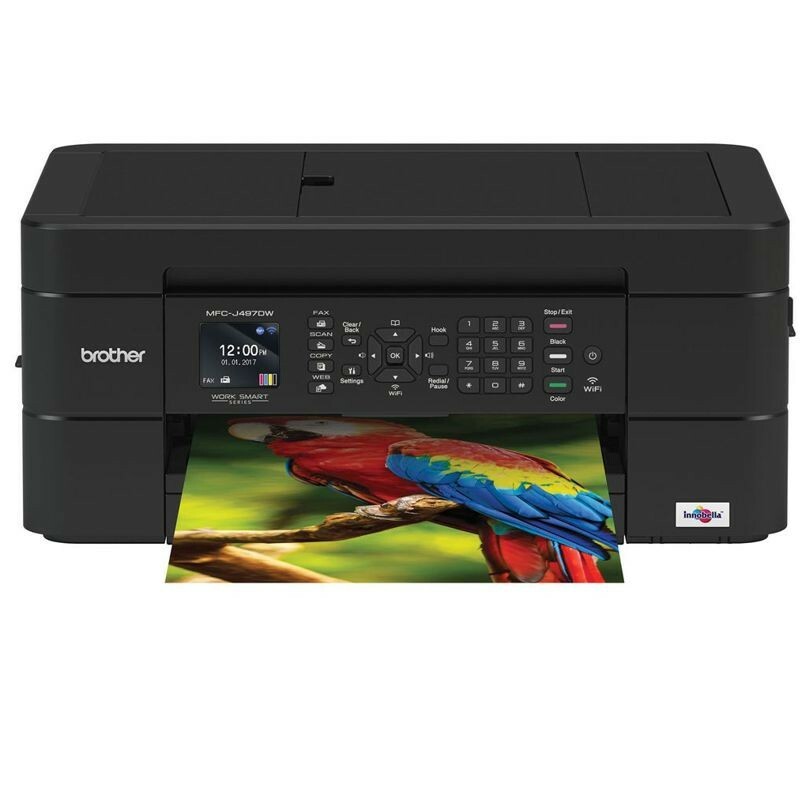 The Brother Work Smart Series MFC-J497DW is easy to connect, compact, affordable and loaded with features and functionality to help boost productivity in your home, home office, dorm room or small office. This wireless colour inkjet all-in-one delivers high-quality output, lets you reliably print, copy, scan and fax and enables wireless mobile device printing from your desktop, laptop, smartphone or tablet. Use the automatic document feeder and 100-sheet capacity paper tray for generous output without constant monitoring and help save paper with automatic duplex (2-sided) printing. Cloud connectivity lets you print-from and scan-to popular Cloud services directly from the printer. Comes with a one-year limited warranty and free online or live chat support for the life of the printer. Compact, and easy to connect. Compact colour inkjet all-in-one printer that fits in tight spaces in your home, home office or small office so you can easily print, copy, scan and fax. Simple to connect your way. Versatile connection options with built-in wireless or connect locally to a single computer via USB interface. Printing as mobile as you are. Print wirelessly from your desktop, laptop, smartphone and tablet. Intuitive Cloud connection. Print-from and scan-to popular Cloud services directly from the printer including Google Drive , Dropbox, Box, OneDrive and more. Quickly scan and share documents. Easily scan and share documents using Brother Cloud Apps. Versatile paper handling. Automatic document feeder and 100-sheet paper tray capacity that adjusts for letter or legal-size paper. Helps save money and paper. Automatic duplex (2-sided) printing plus available high-yield replacement cartridges for cost savings. Intuitive 1.8 colour display. Easily navigate onscreen menus with the 1.8" colour display. At your side support. 1-year Limited Warranty and free online or live chat support for the life of your printer. Paper Handling Size - Paper Tray Letter,Legal,Executive,C5 Envelope,Com-10,DL Envelope,Monarch,A4,A5,Photo 4"x6",Photo 5"x7"